Ochsner Health System in New Orleans is searching for a BC/BE PHYSIATRIST to join our established Department of Physical Medicine and Rehabilitation. Candidates with experience or directly from fellowship are welcomed to apply. Growing outpatient PM&R clinical practice including neurorehabilitation, general musculoskeletal and non-surgical pain management clinics, among others. New 5-story, 125-bed Continuum Care Hospital scheduled to open the 1st Quarter of 2018; floors dedicated to SNF, LTAC, Skilled Nursing, Inpatient, as well as a Brain Injury unit. Physiatrist will be closely involved in the education and training of residents and medical students. Ochsner Rehabilitation specializes in neurological and musculoskeletal rehabilitation in both inpatient and outpatient settings. The Department of PM&R is a service line with an integral collaborative approach to our Neuroscience Institute, a Center of Excellence. Areas of expertise include gait disorders, spasticity, stroke, spinal cord injury, neurological disease and head injury. Ochsner Health System is southeast Louisiana’s largest non-profit, academic, healthcare delivery system providing high-quality clinical and hospital patient care to Louisiana residents since 1942. “Best Hospital” across four specialty categories. Click here to see more of our accolades. Ochsner serves patients from across Louisiana, every state in the nation, and more than 99 countries worldwide each year. Ochsner hospitals and physician offices are located throughout Southeast Louisiana including the Greater New Orleans area, Slidell, Covington, Raceland and Baton Rouge. We are perfectly positioned to provide value and efficiencies in the healthcare reform environment of accountable care, medical homes, budget cuts, declining reimbursement, and increased regulation. For more information, please visit www.ochsner.org or follow us on Facebook or Twitter. 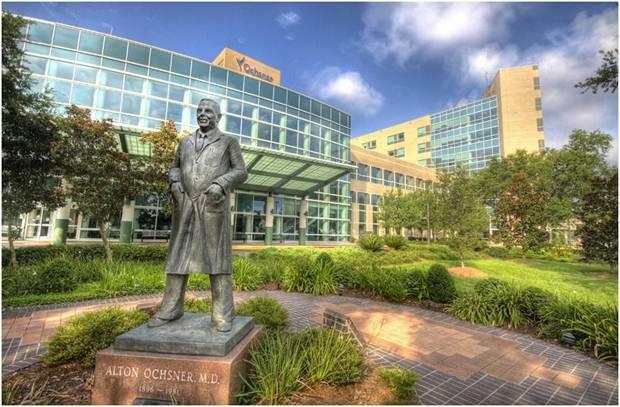 In 2009, Ochsner opened the University of Queensland Ochsner Clinical School, Louisiana’s 4th medical school and one of the top 15 medical schools in the world with more than 275 medical residents and fellows working with 23 different Ochsner-sponsored accredited residency training programs. Ochsner also hosts more than 750 medical students in clinical rotations annually. As an indication of its success, the program currently boasts a 90% Match rate in the National Resident Matching program — with the majority of students securing a place at their first or second choices for residency program. Also of note, 48% of the students choose Primary Care fields, an area of great need in today’s healthcare system. New Orleans is one of the most exciting and vibrant cities in America. Amenities include multiple universities, academic centers, professional sports teams, world-class dining, cultural interests, renowned live entertainment and music. Ochsner Medical Center is located near Uptown New Orleans and includes acute and sub-acute facilities and centers of excellence: Ochsner Cancer Institute, Ochsner Multi-Organ Transplant Center and Ochsner Heart and Vascular Institute. As a 473-bed acute care hospital, Ochsner Medical Center offers the opportunity to learn and provide patient care at a Magnet facility with three Centers of Excellence, all the while gaining exposure to complex medical cases. This campus is also one of six training sites in the world for robotic surgery and is nationally known for many skilled physicians. Ochsner Medical Center has performed the first in utero surgery in the Gulf South region. During a groundbreaking surgery, Ochsner Medical Center’s fetal surgery team of 18 physicians and nurses operated on the 23-week-old fetus while still in his mother’s uterus, a procedure that fewer than 10 hospitals in the United States are able to perform. This surgery corrected a spina bifida birth defect. Ochsner is the first in the Gulf South region to offer the world’s first and only FDA-approved artificial heart - The SynCardia temporary Total Artificial Heart, which serves a as a bridge to transplant for patients with heart failure. Beautiful Beginnings start at Ochsner. The Women’s Pavilion at Ochsner Baptist is a premier destination for women and infants that enables Ochsner to provide a unique experience and the highest quality care for women and their families in a top notch, brand new facility. All women’s services departments at Ochsner Medical Center on Jefferson Highway, including OB/GYN clinics, Labor and Delivery, Maternal Fetal Medicine and Robotic Surgery, and the Neonatal Intensive Care Unit have moved to the new Women’s Pavilion at Ochsner Baptist. The Gynecology-Oncology services will remain at Ochsner Medical Center. Please visit https://www.ochsner.org/locations/ochsner-medical-center for the list of specialties offered at Ochsner Medical Center - New Orleans.